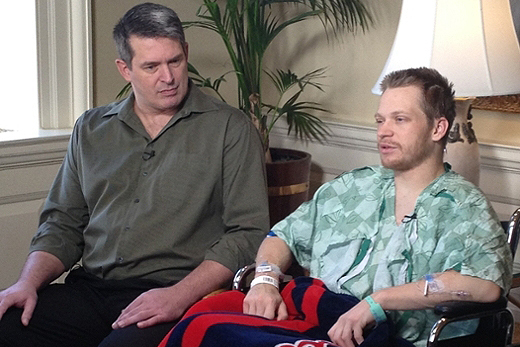 Former Marine, Temple Jeffords (left), donates his kidney to Army National Guardsman, Dustin Brown. Their surgery took place at Emory University Hospital on March 25, 2016. A plea for help via social media led a former Marine to quickly respond, in hopes he could help out a fellow Army National Guardsman in desperate need of a new kidney. Suffering with Stage 4 kidney disease, 28-year-old Dustin Brown relied on dialysis machines to rid his body of waste, salt and water that his failing kidneys could no longer do. Doctors told him a kidney transplant was needed. Brown linked up with Kristi and Raleigh Callaway. Raleigh Callaway, a Greensboro, Georgia, police officer, received a new kidney in 2014 following a Facebook post publically appealing for help. The Callaways and their two daughters held a sign reading, "Our Daddy needs a kidney." The post went viral and over 900 calls came in to the Emory Transplant Center in the few days following the post, all calling to find out if they were a match for the ailing Callaway. Former Marine, Temple Jeffords, saw the plea for help and contacted Kristi Callaway and the Emory Transplant Center. A few weeks later, the 44-year-old Jeffords learned he was a match for Brown. "I have never thought about donating a kidney to anyone, but when I saw another serviceman’s need for help, I wanted to help," says Jeffords. "The testing and donating processes are simple." On Friday, March 25, in side-by-side operating rooms at Emory University Hospital, kidney transplant surgeons removed one of Jeffords’ kidneys and placed it into Brown, who is still serving in the Army National Guard. "The request for kidneys via social media has taken an upward trend in the past few years with positive results, thanks in part to people like the Callaways and the donors that have come forward to assist," says Nicole Turgeon, MD, the Emory transplant surgeon who removed Jeffords’ donated kidney. "Living donor kidney transplants, such as this one, make the wait times shorter for critically-ill patients, while also providing the greatest chances for long-term success, says Turgeon, surgical director of the Paired Donor Kidney Exchange Program at Emory Healthcare. "I am so thankful for Temple," says Brown, just days after his kidney transplant surgery. "Brothers in arms are always brothers, no matter what. He is a super hero in our family." As for the Callaways, since they began their "Our Daddy needs a kidney" Facebook page in 2014, they have assisted in 10 matches with new kidneys.